Google search changes bug or experiment? If you're a keen Google user, you may have noticed something different about it recently. For a couple of weeks, the search facility between its different sections - Web, News, Maps, etc. - stopped being connected via its top navigation bar. But was this an error, or a deliberate experiment? And how have users reacted? From the beginning, several frustrated discussions unfolded across Google's help forums, but Google itself has not yet released an official statement*. We're all rather familiar with the basic idea. 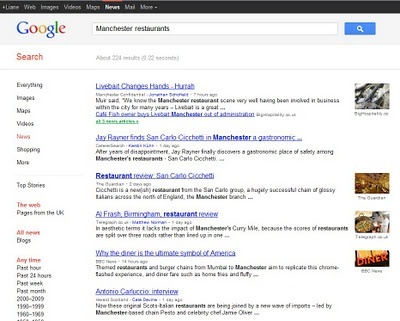 Typing a search term into Google - for example, 'Manchester restaurants' - reveals the web search results for that term. But then, historically, if the user clicked on 'Maps' or 'News' along the top of the page, specific results would display for the same search term. However, this changed during November 2011, 'resetting' the search in some sections. The route to Maps has now been restored - but News remains disconnected*. Okay, so Google's fiddled with a few things. Why is that such a big deal? Inconsistency. The function has worked for some sections while not working for others. Lack of resolution. If it is an error, why has a technical giant like Google taken so long to sort it out? And if it is an intentional change, why not confirm it? The issue seems to have started on Friday, 11 November, when a user named 'redsoxers' took to Google's help forums with a post entitled 'Google Search Broken'. Several people followed suit. On 16 November, a Google employee known as 'Sarah_Me' replied with: "Thanks for your details in reporting. This is a known issue now that we are working to fix." By 19 November, a different message was emerging from the Google camp - this time from 'Erik AS', who said: "We're constantly running experiments and making changes to the interface of Google products to improve the user experience." Both were marked as 'best answer' in their forum threads, despite gaining more negative responses than positive in the helpful answer response system. There is what Google terms a 'workaround' - which is that the same search query can be activated in different sections using the navigation bar on the left-hand side instead. However, this doesn't take account of users' historical Google search habits - ones which they are especially unlikely to break if the old way is still partly functional, as noted with regard to Images; and now Maps. It is also not likely to reassure businesses who rely on Google traffic to search results such as their Places listings, often found via Maps - which was disconnected for half of November. When users don't get what they want when acting by habit, they may not bother trying again. As recently as 27 November, user 'jlouderb' posted: "I'm no Bing fan, but Bing keeps the search term and my search habits are so ingrained I'm off there for a bit. PLEASE PUT IT BACK GOOGLE!" The root of the problem is that change in any form creates anxiety, especially when it happens to something that people regard as integral to their lives. People trust Google to return the results they are looking for in a way that they are comfortable with - and when that is altered without explanation, it can be very unsettling.